I am now anchored in Cruz Bay St John USVI. I never want to leave. This is why I learned to sail. This is why I bought a boat and changed my life. This is what I have worked for for so long. I arrived Thanksgiving at sunrise to a local pot luck with hundreds of people and a couple roasted pigs. They call it Thankspigging! It was a wonderful first day on island. On sat one of my best friends Pete and his wife Irene arrived for a week. We are having a great time. 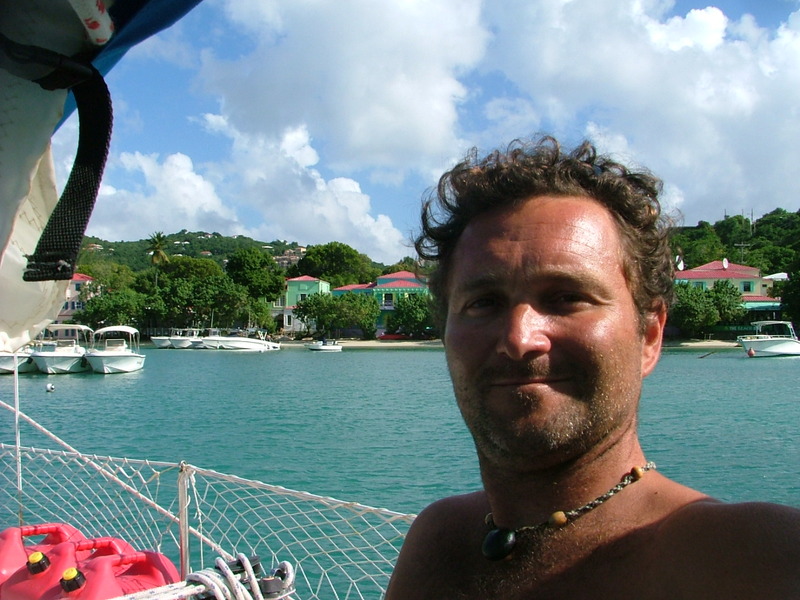 We will sail to the BVI and Jost VanDyke later in the week. Then when they leave Seneca and I will return to Coral Bay here on St John and settle in to our new home for awhile. Plan your trips, I will be here awhile. Pictures and more stories to come. Sounds wonderful! We are so proud of you! Wow, that sounds awesome!! you look like your having a great time. How would you like some company? betsy and I can be there whenever you need a couple of deck hands! !hahah If you ever get lonely, just send us an email and we will book the next flight out!! good for you! Its down to 38 tonight! ACK! I bet your a bit warmer than us!! Glad you’re all set down there. I’ve been thinking of you but am bashful about posting. Shoot me an e-mail at my UVA account and I’ll write more. Missing you in the ville; it was so nice to have you home this summer.